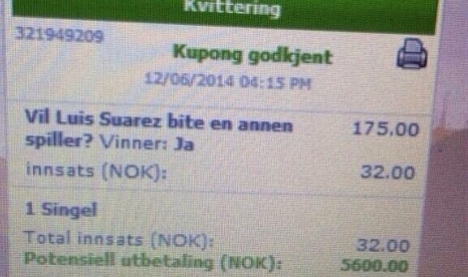 Norwegian Thomas Syversen, won 5,600 krone (€700) after betting that Uruguayan star Luis Suarez would bite another player at the 2014 Brazil World Cup. The young football aficionado staked 32 krone (€3.80) at 175-1 on Suarez to sink his teeth into an opponent during the tournament. Live footage showed the South American leaned his neck toward Italian defender Giorgio Chiellini, while close up images appeared to show five teeth marks on the defender’s naked shoulder as he pulled back his shirt to reveal the imprint to the referee. The incident happened just 14 months after Suarez was caught biting Chelsea defender Branislav Ivanovic, for which he was banned for 10 matches. A Betsson gambling website spokesperson said 167 gamblers placed the same bet with them online, with the biggest payout being almost €2,500. On Twitter, the hashtag #suarezing has also taken over the social media, with people posting themselves biting each other or making teeth related jokes.